The Instant Messenger (IM) proxy service can log the majority of IM traffic. The Smoothwall can also censor instant messaging content, for more information, see Censoring Message Content . Note: The Smoothwall cannot monitor IM sessions within HTTP requests, such as when Microsoft MSN connects through an HTTP proxy. Neither can the Smoothwall intercept conversations which are secured by end-to-end encryption, such as provided by Off-the-Record Messaging (http://www.cypherpunks.ca/otr/). However, using SSL Intercept, see below, the Smoothwall can monitor Jabber/Google Talk and AIM sessions protected by SSL. 1. Go to the Services > Proxies > Instant messenger page. • Enabled — Select to enable the Instant Messaging proxy. • Enable Message Censor — Select to enable censoring of words usually considered unsuitable. The Smoothwall censors unsuitable words by replacing them with asterisks (*). For more information, see Censoring Message Content . • Hide conversation text— Select this option to record instant message events, such as messages in and out, but to discard the actual conversation text before logging. • Block all file-transfers — Select this option to block file transfers using certain IM protocols. Currently, when enabled, this setting blocks files transferred using MSN, ICQ, AIM and Yahoo IM protocols. • MSN — Select to proxy and monitor Microsoft Messenger conversations. • AIM and ICQ — Select to proxy and monitor ICQ and AIM conversations. • Yahoo — Select to proxy and monitor Yahoo conversations. • GaduGadu — Select to proxy and monitor GaduGadu conversations. • Jabber — Select to proxy and monitor conversations which use the Jabber protocol. • Intercept SSL — Select to monitor conversations on Google Talk or AIM instant messaging clients which have SSL mode enabled. For more information, see Monitoring SSL-encrypted Chats. • Blocked response — Select to inform IM users that their message or file transfer has been blocked. This option does not work with the ICQ/AIM protocol. 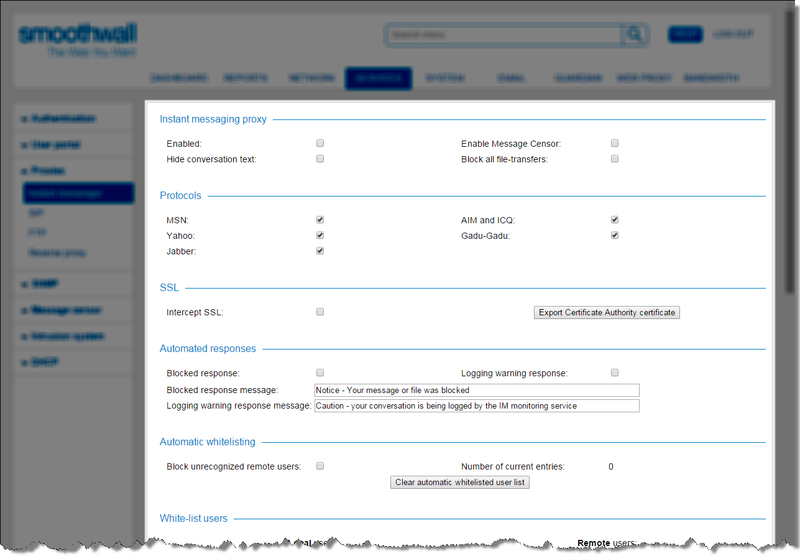 • Logging warning response — Select to inform IM users that their conversation is being logged. • Blocked response message — Optionally, enter a message to display when a message or file is blocked; or accept the default message. This message appears at 15 minute intervals. • Logging warning response message — Optionally, enter a message to display informing users that their conversations are being logged. This message appears once a week. • Block unrecognized remote users — Select this option to automatically add a remote user to the white-list when a local user sends them an instant message. Once added to the white-list, the remote user and the local use can instant message each other freely. When this option selected, any remote users who are not on the white-list are automatically blocked. • Number of current entries — Displays the number of entries currently in the whitelist user list. • Clear automatic whitelisted user list — Click to clear the white-list. • White-list users — To whitelist a user, enter their instant messaging ID, for example, JohnDoe@hotmail.com. • Black-list users — To blacklist a user, enter their instant messaging ID, for example, JaneDoe@hotmail.com. • Enabled on interfaces — Select the interfaces on which to enable IM proxying. • Exception local IP addresses — To exclude specific IP addresses, enter them here. 3. Click Save to save and implement your settings. The Smoothwall can monitor Google Talk and AIM instant message (IM) chats which use SSL for encryption. Note: Using Network Guardian to monitor SSL-encrypted IM chats reduces security on IM clients as the clients are unable to validate the real IM server certificate. 2. Enable IM proxying and configure the settings you require. For full information about the settings available, see Using the Instant Messenger Proxy Service . 3. Select Intercept SSL, select the interfaces on which to enable the monitoring and click Save. 4. Click Export Certificate Authority certificate. The Smoothwall generates a Smoothwall CA certificate. 5. Download and install the certificate on PCs which use Google Talk and SSL-enabled AIM IM clients. The Smoothwall will now monitor and log the chats.